Annan lost this opening encounter in the Betfred League Cup going down by the odd goal to Clyde who took to the field managed by ex Manager Jim Chapman who included ten ex Annan players in his squad. Despite going down Annan boss Peter Murphy could take a lot of positives out of the match but he could not be happy with the manner in which we conceded both goals. It was a match dictated to a large extent by the wind and rain and Annan playing with the adverse weather in their favour in the first half totally dominated the play but for all their control of the ball they created very few scoring chances to trouble Blair Currie in the Clyde goal. The opening minutes saw Annan force a couple of corners one of which saw Dan Orsi test Currie who was at full length to save the low raking shot. At the other end Atkinson was tested when Jordan Stewart got behind the Annan defence to finish with a low shot which had the keeper at full stretch. Clyde’s first real and only scoring opportunity in the first half arrived in the 10th minute when Darren Ramsay picked up a slack Moxon pass to finish with a 20 yard low shot which failed to hit the target. Annan forced 3 corners in the space of as many minutes as they pinned Clyde back with Orsi and Stevenson looking menacing down the left flank. 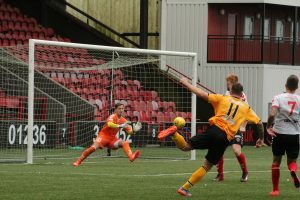 Moxon then headed over the bar in the 18th minute as Annan continued to take the game to Clyde. Aiden Smith was denied by an excellent Breslin tackle in the 18th minute but minutes later Smith was presented with a real scoring opportunity when Annan won a free kick dead centre of the goal on the 18 yard line but Smiths effort failed to hit the target going narrowly past the post. Annan’s pressure at this stage was relentless and Moxon rifled in a low raking shot in the 32nd minute. Clyde won their first corner in the 36th minute immediately followed by another which saw Goodwillie being booked for hand ball. Annan started the second half promisingly with Orsi shooting over the bar but it was Clyde who started to use the elements to their best advantage. Clyde took the lead following a corner after Cuddihy’s shot was deflected for a corner kick, Darren Millers corner was deflected on to Gormley who’s header was well saved by Atkinson but Jack Breslin was well placed to head the rebound into the top corner of the net. It was cruel blow for Annan but the goal gave Clyde a lift and minutes later Creaney conceded a free kick in a dangerous position but Darren Ramsay’s free kick failed to get past the defensive wall. Ryan Sinnamon gave Annan hope with a well struck short from 20 yards this was quickly followed by an Orsi effort which had Currie at full stretch. Clyde made 3 changes in the space of 2 minutes with Osadolor and Max Wright making an entrance for Clyde. Murphy released Aiden Smith into a dangerous position in the 70th minute but the shot failed to hit the target. Clyde secured the match in 89th minute, it was a poor goal for Annan to concede after Murphy lost possession wide on the right and Osadolor released a perfect pass into Goodwillie who’s clinical finish gave Atkinson no chance and gave Clyde a 2 goal cushion. Annan scored a late consolation goal for all their efforts a minute later when Ryan Sinnamon’s cross picked out Steven Swinglhurst who poked the ball into the corner of the net past Blair Currie. It was however all too late for Annan to rescue anything from the game. Despite the defeat there were several encouraging signs that Annan could take from the game , they are still very much a team in development and the 3 Betfred Cup ties looming against Kilmarnock , Ayr United and Dumbarton will ask more questions from the team being assembled by manager Peter Murphy. Annan – Jim Atkinson, Jack Brannan, James Creaney, Peter Murphy, Peter Watson, Steven Swinglehurst, Ryan Sinnamon, Owen Moxon, Aiden Smith, Ryan Stevenson, Daniel Orsi. Subs not used Alex Mitchell, Raffi Krissian, Scott Hooper, Ayrton Sonkur, Kevin Rutkiewicz. Clyde – Blair Currie, Callum Home, Jodan Stewart, Martin McNiff, Jack Breslin, Barry Cuddihy, Darren Miller (Scott Ferguson 72 min) , Mattew Flynn (Max Wright 72 min), David Gormley ( Smart Osadolor 70 min), David Goodwillie, Darren Ramsay. Subs not used Kyle Bradley, Mark Burbidge, Lewis Wilson. Referee – Duncan Williams Assistants – Stephen Mitchell and Chris Rae.